The Durango model has 2 Beds and 2 Baths. This 800 square foot Double Wide home is available for delivery in Arizona, California, Nevada, New Mexico, Colorado, Utah. Looking for a comfortable, well-appointed yet decidedly modern mobile home? If yes, give the exciting Durango model a studied look. 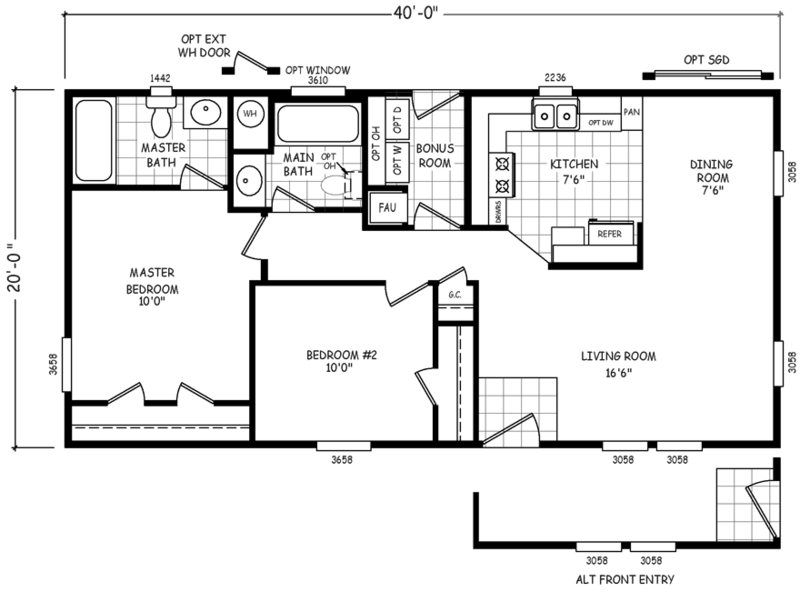 A great value by any standard, it has a special layout in that the master suite lies at the end of a conveniently long hallway. The hallway separates the noisy common area from the more peaceful bedrooms and features a handy guest closet. Ask about the alternate front entry layout. If pictures are shown, they may depict upgrades and options that are not included within the base price of the home. Ask your housing consultant for details about the other great features that come standard on the Durango manufactured home.